This is an overview of The Kings Highway Series: The Way of Agape, Be Ye Transformed, and Faith in the Night Seasons. This set has approximately 5 hours of teaching. Session 1 – Love of God: Nancy shares the intimate details of her 20 year, stormy marriage and how God turned it around. The secret was learning what His Agape Love is and how it differs from natual love. 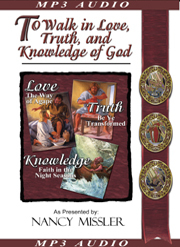 Session 2 – Truth of God: In this sequel, Nancy teaches us the practical application of renewing our minds. Only in putting off our fears, anxieties, depression, anger and unbelief; and putting on Christ can we be free to reflect Him in all we do. Session 3 – Spirit Filled Temple: To explain how the Love of God, Truth of God and knowledge of God works within each of us, Nancy draws a visual comparison between the architecture of man as the “temple of God” now (I Cor. 3:16) and the architecture of Solomon’s temple way back in the Old Testament. Her conclusions are absolutely fascinating. 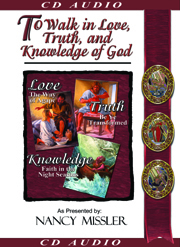 Session 4 – Knowledge of God: Speaking from personal experience, Nancy shares the details of her own devastating “night season” –bankruptcy, the loss of their home and friends, a 6.8 earthquake under their rental home and finally, the unexpected death of her son. She not only tells her own story, but goes on to explain why God allows times like these and what we are to do to get through them. Also Available as an MP3 Download!